There are a lot of TV shows out there. No, really! Take a look. There's a lot of stuff that has been made, much of it short lived. Almost all of them, rather shockingly, have little bits and pieces that bear some passing resemblance to reality, and some even include topics that touch on science or scientific ideas. The good ones may stretch imagination a bit and force us to suspend disbelief, but we're okay with that; the story is intriguing, the logic internally consistent (mostly). Then there are those that make no sense whatsoever. They have plot holes big enough to sail a cruise ship through. For whatever reason, I watched a show that fell into the latter category. It only lasted one season before being canceled, and I watched every single episode. Why do this to myself? Why put myself through such mind-boggling nonsense? Well, one, because I have Netflix and I could stream it; two, because there was an intriguing element to the storyline, wondering how things might end; and finally, because I just couldn't believe that they could get simple scientific ideas so completely wrong. The writers just had to redeem themselves. Large reptilian creatures that lay eggs and lack mammary glands are actually mammals! Now, you may argue that there are similar animals that are considered mammals like the platypus. Yes, platypuses (platypi? platypodes?) lay eggs, but they have mammary glands. That has been the predominating feature that defines mammals: mammary glands. Well, no more! According to Dr. Laura Daughtery, a marine biologist, upon catching a fleeting glance of one of these behemoth amphibians, says that it is a mammal. This is reinforced by another character, Dr. Aleksander Cirko, who discovers the carcass of one washed up on shore. Defying all classification schemes, this creature is not a reptile or amphibian. It is, in fact, a mammal. To find the depth of the ocean floor or find objects underwater, scientists use radar instead of sonar. Some among you may have learned that water, especially seawater, absorbs microwaves, which includes radio waves. Not so. Once again, Dr. Laura Daughtery gives us this bit of wisdom, asking her friend to use radar to find out how far down the ocean floor is. So the next time you are going out on a boat, if you want to find out the distance through water of some object, do not use sonar, use radar. This next one is more about engineering than strictly science knowledge, but apparently it is possible to build a submersible, with working air scrubber, sonar (or maybe radar), portholes, lights and other electronics and so on in less than a week. Okay, willing suspension of disbelief. No one wants to see months and months of building and testing the rig to make sure it works, so I suppose I can let this one slide. Besides, Dr. Laura and her crazy buddy Rich (whose brother was dragged into the depths after spearing one of the big mammals during a dive) are on a schedule. They managed to figure out the migration pattern of the creatures, and the critters are only going to be at a spot for observation for one day! Which brings us to the next bit. When large aquatic animals, like whales or mammalian amphibians that lack mammary glands and happen to have a connection to electric eels, migrate, contrary to popular belief, they don't hang around an area for days or weeks. They only like to hang out for a day, two tops. So if you want to see them, you need to find the exact spot they migrate to and get there on exactly the right day. Do that, and you'll be sure to catch a glimpse of them. If not, you'll just have to hang around somewhere to see the migratory creatures that didn't actually migrate, 'cause of course, a migratory species doesn't actually migrate unless there's a time-sensitive plot point to achieve. Remember that homemade submersible? Well, if you choose to build one, remember to install an inflatable life raft on the outside, just in case the cable breaks. 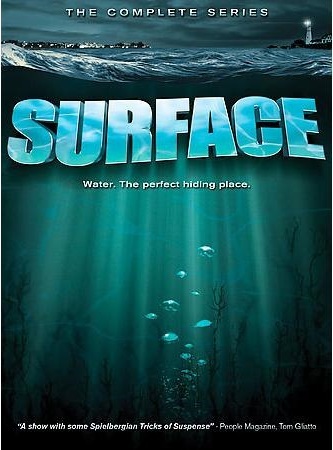 You see, I also learned a little about buoyancy from this show. A life raft big enough to hold two comfortably or four cramped, if inflated around 7,000 feet underwater, will happily lift your several ton tin can and many more tons of steel cable up to the surface. Not only that, but when your air scrubber fails and you only have minutes of oxygen left to breathe, don't worry. The life raft will get you to the surface in no time at all, so you won't pass out or suffer any ill effects of oxygen deprivation and CO2 intoxication. And because you're in a submersible, you won't have to worry about the bends. I could go on, but I think you get the idea. There are a number of other things that I either forgot or about which my brain has rebelled and refuses to recall. I did, however, find a review of the show from 2009, courtesy of a blogger named Amanda. She pretty much nails the feel of the show and the plots holes I hinted at earlier. 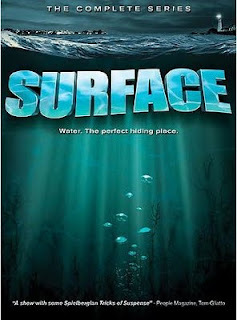 Hopefully if the writers of Surface ever make another show, they'll consult The Science & Entertainment Exchange first. Mary Tocco, Is She Mistaken or Misrepresenting?